Barnet: a battle lost but who’s winning the war? Justice for the SOAS 9! A living wage for cleaners! 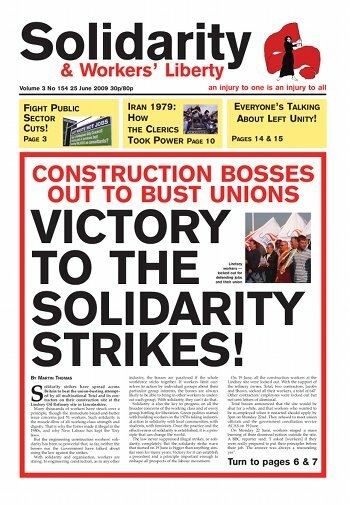 Victory to the solidarity strikes! Can you have more? Of course you can! 15 August: oppose the RWB! Is the People’s Charter the answer? Union leaders start to bark, but will they bite? Build a Socialist Alliance to fight back! Why would a bunch of environmental activists support workers in an oil refinery? Regime crackdown in Tehran - solidarity with the workers, women and students! Three activists from Workers’ Climate Action and the AWL visited the Isle of Wight on 15-18 June because we had heard that the Vestas plant there — the only wind turbine blade factory in Britain — faces closure. After four days’ work, we have a meeting set up, sponsored by Cowes Trades Council, to launch a campaign against the closure. We will be going back to the Isle of Wight, with other activists we hope, to build for that meeting in the week leading up to 3 July. There’s no decision yet made about the next lot of action, but there will have to be further action, because Royal Mail have not moved. The problem is, these are local fights over a national issue, arising from the poor deal made after the dispute in 2007. That deal gave Royal Mail bosses a national commitment to “flexibility”, which has allowed them to do things they could never have done office by office. The (overwhelmingly female) student protesters led chants on megaphones, carried placards with their own powerful slogans, and spoke eloquently and emphatically to the national press about what ESOL means to them. Key messages were the need for English to allow them to support their children’s learning, so they can be a part of their communities and so they can work. The admin offices of the School of Oriental and African Studies (SOAS) in London were occupied from Monday 15 to Wednesday 17 June, in response to an immigration raid on SOAS cleaners. The raid was organised by ISS, the contractor for SOAS, and several cleaners were deported. Despite a lively campaign against the plans, Barnet’s Conservative Cabinet voted on 8 June to axe the borough’s sheltered housing wardens. They will be replaced with ‘floating support’ — a much reduced number of wardens operating out of a handful of local ‘hubs’. In theory the floating supporters will also serve elderly residents not in sheltered housing schemes. Since the budget for all of this has been cut from £1.4 million to £950,000 it’s clear that services to elderly people in the borough have been reduced. “On 17 June we, the detainees in the Family Unit (Crane) at Yarl’s Wood Immigration Removal Centre, were attacked at around 2 pm by SERCO officers from Immigration. [SERCO is the contractor that runs Yarl’s Wood]. This is due to the fact that we decided to do a hunger protest, which is peaceful. Our children are sick. There are a lot of people here that are sick. There is a woman with epilepsy who is not been taken care of properly. Two weeks after nine cleaners at SOAS were taken into detention, campaigners are calling for action for justice for the SOAS 9. They are also appealing for solidarity with detainees in Yarl’s Wood detention centre who are on hunger strike for demand including freeing children who are detained, adequate access to health care, quality food and real privacy. The two days of strike action on the London Underground over pay, job cuts and management bullying, 9-11 June, were a big success, with management unable to get services running until well into the morning, and then only token shuttles for PR reasons. The day we started striking, RMT and management reached a deal at ACAS, only for management to “get a phone call” and pull it. The “deal” may not even have been that great, but management showed their true colours: claiming to want a deal then backing out when one was on the cards.